As I've shared on my two recent posts, I went to Singapore last June to visit Trickeye Museum. it's my second time to visit actually. I also went last October for my birthday. I loved it the first time, the second time, I just didn't want to leave. The experience is incredible! It's like all your childhood dreams/crazy thoughts being brought to life. From being a Mermaid, to riding a flying bike, even being held hostage by a giant baby. I swear, it's like being stuck in a teenage dream. Trickeye Museum originated in Seoul, Korea. And because of the Museum's popular demand, they branched out in Busan, then opened another one in Singapore. What is trickeye Museum? it's a Museum over 80 three dimensional paintings and sculptures in six themed zones. And the fun part is that it's not like an ordinary Museum where in you are not allowed to touch anything. Trickeye actually requires/lets you touch all the paintings and sculptures and even take photos with it. How awesome is that?? If only you guys saw my face the first time I visited trickeye. It was like the first time I tasted chocolates. Just pure happiness and excitement. I'm encouraging you all to Visit Trickeye Museum. Bring your family or your friends with you. It's worth it! Alora and I had a blast! and I'm sure you will too. Book now! and experience the fun that Trickeye Museum Singapore offers! with that said, Trickeye Museum Singapore and I have a special treat for you all. If you're planning to visit Trickeye Museum Singapore, You get 20% discount if you use the discount code: DANIBARRETTO when booking your tickets online via Trickeye Museum Singapore's website: https://bookingtrickeye.com/index.php/en/ or you can also purchase the discounted tickets on their on-site ticket booth with this discount code. Just when you think the good news is over.. think again. I haven’t hosted a giveaway in a long time. So here’s a big one! 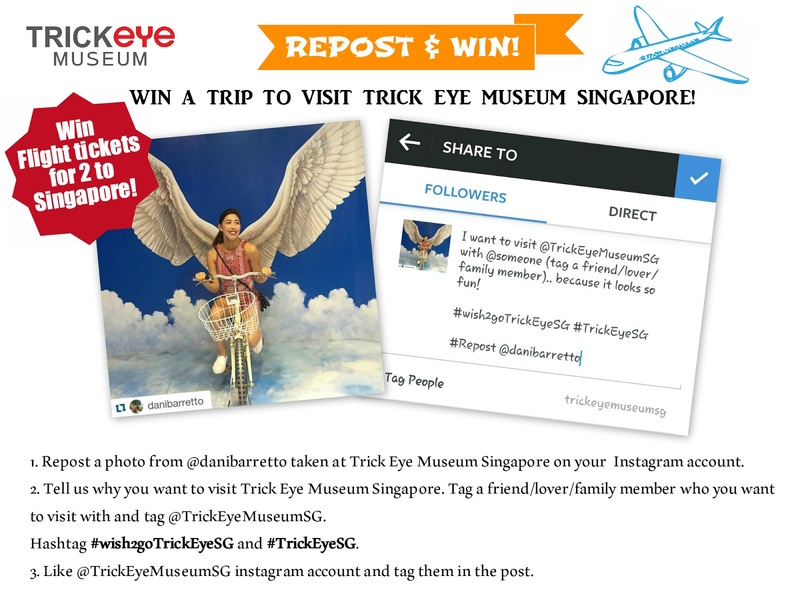 One SIE reader will get a chance to win a ticket for two to SINGAPORE to visit Trickeye Museum. The winner will be chosen by Trickeye. All you have to do is repost any of my photos from Trickeye and tell me why you deserve to win. Don’t forget to include the hashtags #wish2goTrickeyeSG and #TrickEyeSG, #SIExTrickeyeSG.